Catherine Heard, Director of ICPR’s World Prison Research Programme, writes on a new report looking at disparities in prison use in ten countries, across five continents. March 16th saw the launch of our new report, Prison: Evidence of its use and over-use from around the world. Over 40 guests came to the launch (kindly hosted by the law firm Clifford Chance) to hear about the report’s highlights and watch presentations by experts on imprisonment in Brazil and the Netherlands, two of our featured countries. The event was also addressed by speakers from the international human rights NGO, Fair Trials, who co-published the report and are ICPR’s partner on the wider project – of which the new report is the first output. Given ICPR’s strong focus on prison statistics (as hosts and compilers of the World Prison Brief) we want to ensure this project never loses sight of the many ways prison affects people: not only those imprisoned, but their families, their wider communities and the people who work in prisons. That is why a core element of our methodology in the wider project is about mapping the ‘custody journey’ in each country. That means drawing on real cases to understand the lived experience of criminal justice and imprisonment – after arrest, in pre-trial detention, during custodial sentences and after release. Every human story behind a prison statistic has something to tell us about how a particular country uses imprisonment to respond to crime. The importance of listening to the human story came out clearly from the presentation by Jago Russell and Alex Mik of Fair Trials, about their work with individuals who have experienced unfair treatment in criminal justice systems. They played a one-minute animation by the Royal College of Art and filmed interviews with three people who have experienced pre-trial detention in different European countries. These can be viewed on Fair Trials’ website. I was struck by what Jago had said in his Foreword to our report: ‘Statistics alone can sanitise reality – they do not speak to the violence, intimidation and isolation that are part of the daily experience of custody’. Who better to pick up this theme than Dr Sacha Darke, from the University of Westminster? Sacha has visited 30 Brazilian jails and is an expert in the country’s sad history of uncontrolled growth in prisoner numbers – Brazil has seen prisoner numbers increase twenty-fold from around 30,000 in 1973 to over 600,000 today – and the violence and horror this has unleashed. He showed images from recent massacres and riots in prisons in northeast Brazil (discussed on pages 8 to 10 of our report). He then described the importance of prisoner governance, and organised crime group affiliation in Brazil’s prisons. Organised crime groups are by-products of wholly inadequate staff/prisoner ratios. In many of Brazil’s prisons, the role of staff is essentially to guard the perimeter, while prisoner ‘trusties’ are left to organise, arbitrate and discipline on the inside. It was clear from Sacha’s presentation that Brazil’s prisons have always been in crisis and that there is no real prospect of enough capacity being built to change this. But, on a brighter note, he spoke of his visits to some of the country’s ‘community prisons’. These first emerged in the seventies in São Paulo and, though few in number, they are very different from the hellish, overcrowded prisons that prevail in Brazil. There is close collaboration between the prisons and prisoners’ families and communities. Many ex-prisoners come back as volunteers. Governors and senior managers are often former prisoners. Sacha referred to Fiona Macaulay’s research on Brazil’s community prisons, which have been praised as exceptionally humane in approach. The Netherlands: reversing the punitive turn? It was then over to Professor Francis Pakes (University of Portsmouth) to address the question: how did the Netherlands reverse its punitive turn? As explained in our report (page 21), after decades of low imprisonment levels, the Dutch prisoner rate surged from the late eighties, increasing by 200% and peaking at 134 per 100,000 in 2005. Interestingly, despite a strong Dutch tradition of criminology – and good statistical data – there is no consensus on precisely why the subsequent turnaround happened. After hearing Francis speak, I was confident that in choosing the Netherlands we’d picked the right country to contrast with the high incarcerators featured in this report. There is a lot we can learn from the Netherlands. Maybe our project will contribute to the on-going inquiry about how the Dutch turned around their prison juggernaut. Read the press release about the report. The World Prison Brief The statistical data in the report are sourced from the World Prison Brief, compiled by Roy Walmsley and hosted and published by ICPR. 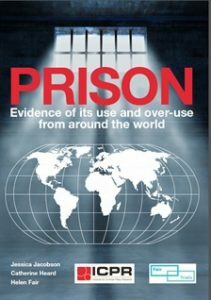 This unique and internationally renowned online database contains a wealth of information on prisons and the use of imprisonment in 226 independent countries and dependent territories around the world. The Institute for Criminal Policy Research (ICPR) is based at the Law School of Birkbeck, University of London. ICPR conducts policy-oriented, academically-grounded research on all aspects of the criminal justice system. ICPR’s work on this report forms part of ICPR’s World Prison Research Programme. Category: Law Tags: crime, criminal justice, Institute for Criminal Policy Research, jail, law, prison by Louisa.